Project Summary — Got Malware? Posted On Wed, 16 Aug 2017 00:34:50 +0000. Filed in ramblings. By Vaibhav Bhandari. 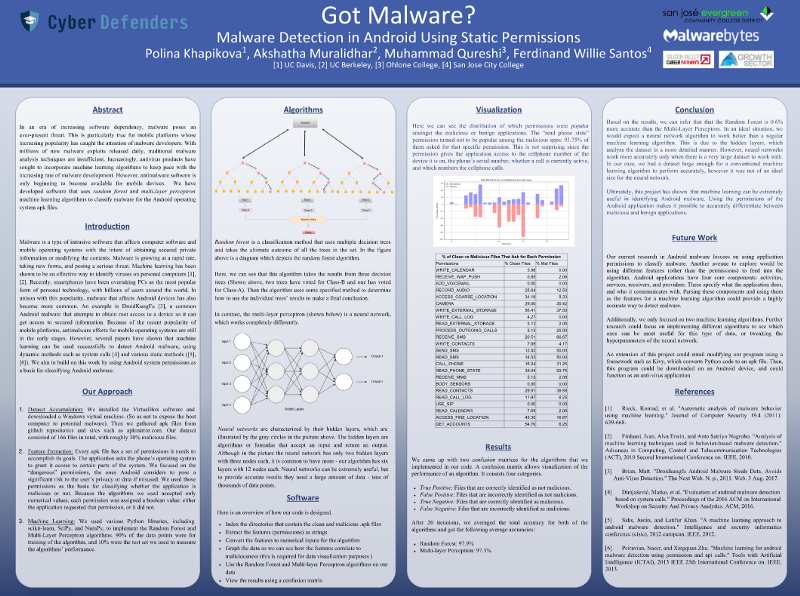 Editor’s Note: This post links to the final presentation artifacts — poster and powerpoint presentation of team Got Malware. Overtime we will add presentation videos as well. This post is authored by Polina Khapikova. Our group spent most of last week preparing for the presentation and poster session that marks the end of our internship. Here are the links to the presentation and the poster. In both of them, we discussed what made us want to research malware, and the unique challenges that Android malware detection faces. Then, we explained machine learning, how our software works, and the results of our experiments. We are also working on a research paper, that we will hopefully be able to finish before the start of the fall semester.